Have you ever found yourself in a bad place? Perhaps by your own decisions or the actions of others forced you in a scene of desolation. Jacob found himself in a bad place. As the grandson of Abraham and the future patriarch of the twelve tribes of Israel, he was filled with the pursuit of his own selfish gain until the Lord stepped in. By God’s grace and mercy, Jacob’s descendants led to the birth of Jesus and the salvation of those who put their trust in Him. God promised Abraham that his seed would be multiplied throughout the earth like the countless stars in heaven and the sand by the ocean. In their old age, Abraham and Sarah miraculously had a son, Isaac. Isaac and his wife, Rebekah, had twin sons with Esau being the older and Jacob the youngest. Jacob grew up under the tender care and preference of his mother, Rebekah. She desired that her favorite son receive the blessing of Abraham through Isaac to secure his future. However, instead of seeking the Lord first, Rebekah conspired with Jacob to trick his father into giving him the blessing instead of Esau. As a result, Esau’s heart was filled with hate and rage as he vowed to kill his brother after their father’s death. Jacob had to leave immediately for his uncle’s home in Haran. He probably left quickly in secret and took to hiding on off beaten paths to avoid being followed. When Jacob finally fell asleep, he was most likely exhausted. In this moment, the Lord revealed Himself to Jacob in a dream. This vision opened up heaven for Jacob to see angels ascending and descending from the throne of God. The Lord promised that Jacob’s descendants would return to the land, would multiply in population, and would bless all people on the earth. 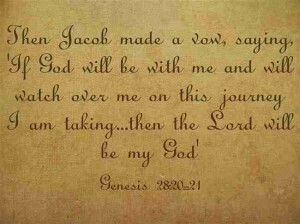 In addition, the Lord promised to be with Jacob for the rest of his life. In response to this great vision, Jacob built a pillar and committed his life to following after God. Jacob failed in many ways, but he never turned away from God to worship or serve other gods. The Lord fulfilled His promise to Abraham through Jacob’s son, Judah, leading down the generations to the birth of Jesus Christ, the Messiah. What can we learn from Jacob’s ladder? “Jacob left Beersheba and set out for Harran” (Genesis 28:10). It was necessary for Jacob to leave not only to preserve his life, but also to save the godly seed. Jacob needed to marry in the family line in order to produce children of the promise. If he stayed in Beersheba, he may have fallen into Esau’s error of marrying Canaanite women. The Lord may lead you to a place of desolation to preserve your holiness, purity, and sanctification for His eternal purposes. You may need to come away by your own choice or by circumstances out of your control. No matter the reason for your move, the Lord is ultimately in control of your life and He will lead you to the right paths when you surrender to Him. “Taking one of the stones there, he put it under his head and lay down to sleep” (Genesis 28:11). Deceitfulness takes a lot of energy. Jacob may have been exhausted from all the stress and energy to pull off what he and his mother did—killing of the calf, cooking it just right, putting the fur on his arms, and attempting to trick his father. Afterwards there may have been regret and shame for their trickery. You may need to come away from everything that pulls you away from the Lord and take a time of rest. A period of time for meditation, prayer, and reflection can bring repentance leading to restoration of joy and peace. The Lord speaks in a still, small voice to your spirit after you quiet the emotional and physical noise. “There above it stood the Lord, and he said: “I am the Lord, the God of your father Abraham and the God of Isaac” (Genesis 28:13). Jacob probably knew the promise of God to his grandfather, Abraham. It may have been tempting to only desire the material blessing while ignoring the spiritual significance. Jacob didn’t have his own personal experience with God until the vision. The Lord longs for each of us to have a personal relationship with Him. It’s a wonderful blessing to come from a godly heritage of believers—yet that isn’t enough for your spiritual growth. You need to come away to know God for yourself beginning with an intimate familiarity with God’s word. 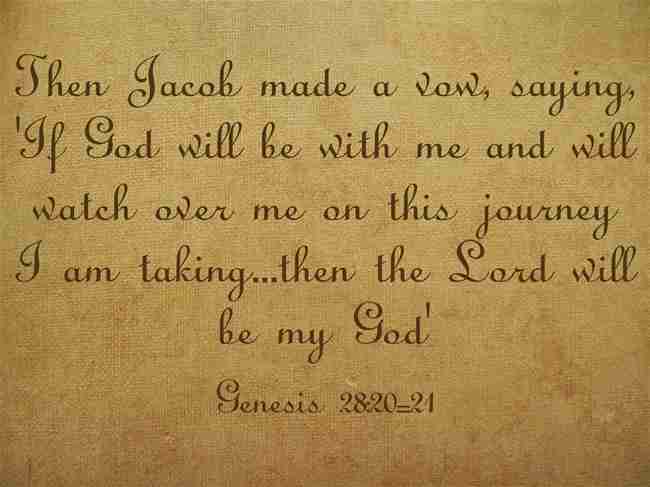 “Then Jacob made a vow, saying, ‘If God will be with me and will watch over me on this journey I am taking…then the Lord will be my God’ “ (Genesis 28:20-21). Jacob knew that God was in that place of pain with him. The immediacy of his actions showed the intent of his heart to completely commit to God. Jacob could’ve chosen the way of Esau, but instead he chose to follow God. Every believer has to come to the place of recognizing the hand of God over their lives. There is no greater response to this recognition than a complete surrender of your will to the Lord. This complete change of heart and mind will seal your faith in God in spite of what the future holds. Your bad place may be just as desolate as it was for Jacob. The landscape of loneliness and disappointment is fertile ground for unbelief for the weary soul. Yet there is hope for you! Recognize that God is with you and will never leave you even when you feel alone. By faith today receive the Lord’s encouragement, hope, and promise for your future. Crystal, I am newsletter editor of my church in Charlotte, N.C. I read your post on Jacob’s Ladder that was published Sept. 2013. I am writing to get your permission to have it published in my church’s newsletter with credits to you. I look forward to hearing from you asap.